Battered by 15-foot waves and a fierce northeaster, the steamer W. H. Sawyer’s luck ran out on Aug. 11, 1928 as the vessel raced for the safety of the Harbor Beach, Michigan breakwater. The Sawyer plunged to the bottom of Lake Huron just three hundred feet from safety and within sight of the Harbor Beach Lifesaving station. The wreck dropped in an upright position in shallow water so its two masts were visible for days, marking the grave of the ship’s cook, who went down with it. John J. Buckley, Detroit, signed on as a cook only days before the Sawyer sailed on its final journey. Buckley reportedly became seasick during the storm and went to his bunk. He became trapped below when the Sawyer sank. His body washed ashore about a week later. Steaming north with the barges A. B. King and Peshtigo in its tow, the Sawyer was on its way from Toledo to Lake Superior with a cargo of salt. The barges were carrying either crushed limestone or salt. The three boats were caught in heavy fog and anchored for about a day in the St. Clair River, so Capt. August Galonbisky was pushing his 38-year-old vessel through the storm to make up for lost time. He chose not to make an unscheduled stop at Harbor Beach that day to escape the brunt of the gale, even though the storm was strengthening at that hour. Galonbisky had second thoughts later in the night when the winds reached an estimated 50 miles an hour and the Sawyer’s wooden hull began to break open from the pounding the seas were giving it. He turned around somewhere off Port Hope. As the Sawyer turned, however, the towlines parted, leaving the two barges to battle the storm on their own. The King, a 177-foot converted schooner, was carrying a crew of six men and a woman cook. 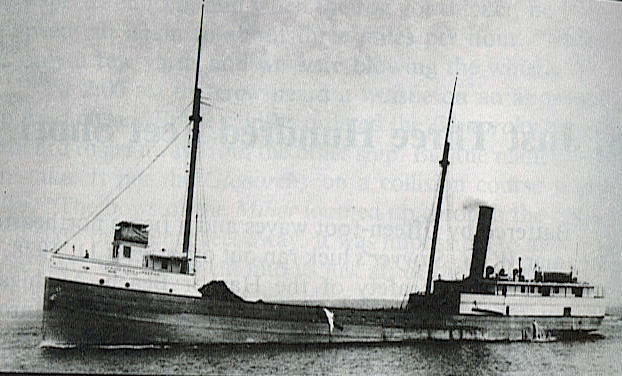 The Peshtigo, 201-feet-in-length, had a crew of seven aboard. Both barges were blown into the rocks near Port Hope and both crews were rescued by Pointe aux Barques lifesavers. Meanwhile, the Sawyer was racing with the wind at her stern for Harbor Beach. Galonbisky knew by now he was in trouble. His ship had taken on a serious leak, the water was mixing with the salt in the cargo hold, and the salt was jamming the ship’s pumps. In other words, the Sawyer was sinking. Just before 3 a.m. Commander Davidson at the Harbor Beach lifesaving station was watching the Sawyer’s lights as the vessel approached the harbor entrance. Davidson knew from the way the vessel was taking the wves that it was foundering. He got his lifesaving crew assembled. The Sawyer sank so quickly that Galonbisky, his first mate, and wheelman were all thrown into the water from where they stood in the wheelhouse. All three were picked up by the lifesavers. Other crew members swam or floated ashore, clinging to wreckage. Wreckage from the Sawyer came ashore for miles along the coast. The wreck had to be destroyed by dynamite to clear the harbor entrance. The Peshtigo was the only one of the three vessels salvaged. The King also was declared a total wreck.